The New LSG Insulated PeeWee - The BBQ BRETHREN FORUMS. 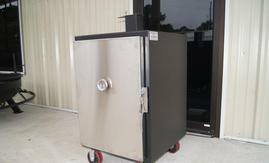 I have be wondering if they were going to compete in this size of smoker and here it is. A whole family of Webers. I like it! High probability I will get one since even the Mini was too much smoker for me considering I have the VOS, drums, etc. That is a fine looking smoker for sure. I like that the price is far enough from the mini that you can justify getting the smaller one. I'd like it a lot better at $1500. Was ther a pic? I didn’t see one. Just a “coming soon” video. I'd get one if I had the Funds.....Hits $2500 with options and tax without side table........ . $3052 on Mini with options plus tax - without side table. Last edited by SmittyJonz; 12-06-2017 at 08:18 PM.. I agree with you on the cost. It would be a lot nicer if the price was closer to $1000-1500. I'm not secure enough with myself to buy anything called a peewee. You could claim you're under compensating. Im pretty sure it was them that I got a quote from a couple of years ago. It was 6 or 7 hundred bucks for shipping and I believe $150 creating fee. It was a deal breaker for sure. I thought the pics shown in the link were for the Pee Wee. Perhaps all the pics were for the Mini? Not sure. No pictures on the peewee yet. just dimensions. I like the size info given. My father-in-law has been interested in getting a mini like I have, but I think he still wants a smaller footprint. It maybe perfect. Looking forward to the video.